Eurocom offers Trusted Platform Modules 1.2 (TPM) in its line of fully upgradeable, highly configurable, high quality Notebooks, Mobile Workstations and All in One Desktops to offer enhanced security to customers. Eurocom systems from 11.6” to 17.3” Notebooks and Mobile Workstations, even All in One Desktops complete with high end processors, graphics, memory, storage and TPM modules for enhanced security protection. The range in size, mobility and capability provides customers with the exact system that meets their requirements, while further configurability and upgradeability allows users to choose the exact components and configuration they need. “Many of our customers utilize their Eurocom equipment for engineering, design, software development and other activities that involve valuable intellectual property information. Due to this, we feel the need to provide them with the utmost in secure computing to keep their information and livelihood safe and secure.” Mark Bialic, Eurocom President. 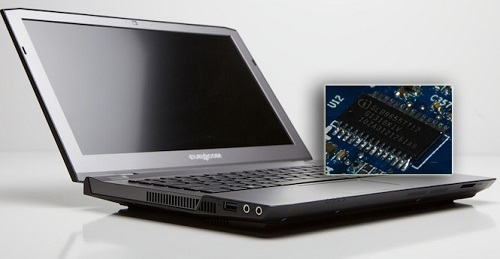 For business class Laptops, Mobile Workstations and Desktops, the Trusted Platform Module is the most widely used hardware module capable of protecting certificate private keys with a high level of confidence. “For users that require the most secure laptops and mobile workstations, Eurocom systems are the answer” Mark Bialic, Eurocom President. Individuals and enterprises face a much higher security risk if they do not adequately implement and protect themselves. Eurocom notebooks with TPM gives users higher assurance security solutions that can protect them not only from today's threats, but also from many potential future threats. Eurocom has coupled integrated biometric fingerprint readers and Trusted Platform Modules to secure systems from unauthorized access. An integrated biometric fingerprint reader paired with a Trusted Platform Module 1.2 reader secures this system from unauthorized access. On the security front, the Trusted Platform Module (TPM) 1.2 from Infineon Technologies ensures that passwords, certificates and keys don't fall into the wrong hands.